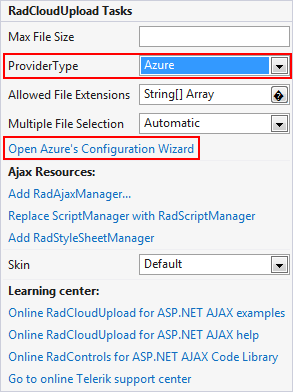 RadCloudUpload can upload files to Azure Blob Storage. 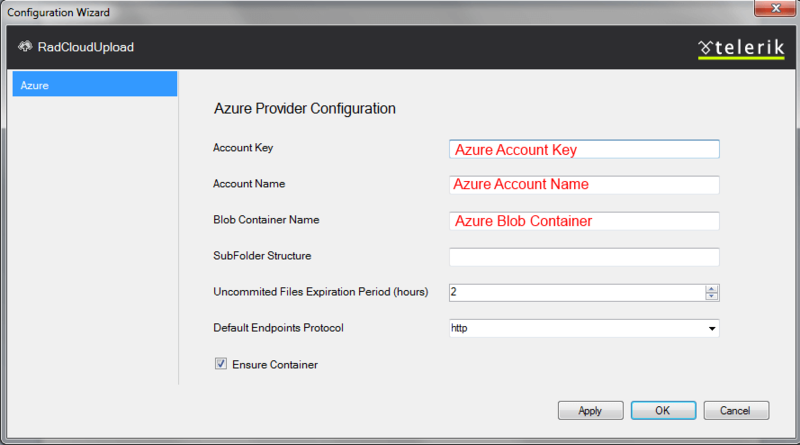 It is built on the top of Windows Azure Blob Storage Service in .NET. To work properly, the control needs a reference to some of the client libraries included in the Windows Azure Storage which is a part of Windows Azure SDK for .NET. The Windows Azure Storage package is distributed through a NuGet feed and can be easily installed through the Package Management Console. Table 1 shows the command to install the version you need according to the Telerik.Web.UI version you use. For version 3.0.2, only the Microsoft.WindowsAzure.Storage.dll assembly with version 3.0.2.0 is used by RadCloudUpload. For version 1.7.0.0, only the Microsoft.WindowsAzure.StorageClient.dll assembly with version 6.0.6002.18488 is used by RadCloudUpload. The Microsoft.WindowsAzure.Configuration.dll assembly is not used, but the other dependencies may be used by the Azure code. When a Web Application type of project is used the Copy Local property in the Reference Properties dialog box, available from the References pane of the Project Designer must be set to True . If you use newer versions of the WindowsAzure.Storage package, there is a risk of a breaking change in the library to break RadCloudUpload. File uploads may stop working or you may get errors such as NullReferenceException from Telerik.Web.UI.CloudUploadHandler.GetEncryptedText. Uploading in Azure is done on chunks. Every chunk has size of 2MB. These chunks that were cancelled during the uploading are removed automatically by Azure. When older browsers are used (IE9 or below), files are uploaded at once, because chunking is not supported. In order to upload files larger than 4MB, it is needed to increase the maximum allowed file size. For more details please refer to this article.